This little guy is fondly known as the puking pumpkin....nice! That was a yummy cheese & sausage dip our friends brought. Pumpkin was done by moi! Behind him you'll see the marshmallow ghosts topped with chocolate, and some sour gummy worms. 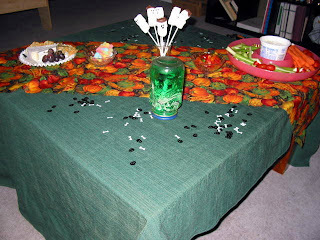 For the grownups during our scary movie - fruit, cheese, crackers, & a veggie tray with dip! 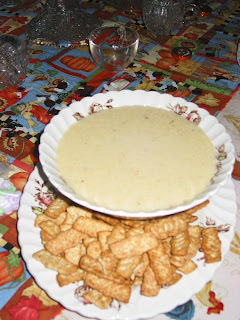 And to fit with the gross theme, this dip, which is usually a mixture of pineapple preserves, horseradish and dry mustard, then served over a block of cream cheese, was blended together. Instead of my Jezebel sauce, it became Jezebel's vomit dip. Nice & classy, right? It tasted good though!! So now I am planning a similar get-together for this year. I will still have the puking pumpkin, and I am making some cupcakes that will have icing piped on to look like mummy wrapping. The rest of the menu is up in the air! 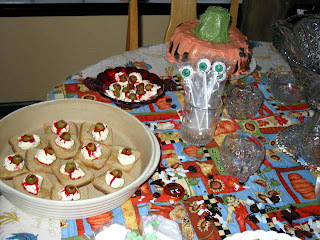 I have been looking at the Top ten Halloween recipes at Taste of Home magazine, where I am a new Field Editor. They have some great ideas! I think I bought half the Halloween department at Walmart the day after Halloween last year!! (Gotta love those 50% off sales!) So this year I have more serving dishes, plates, napkins, and other Halloween decor to use for this get together! 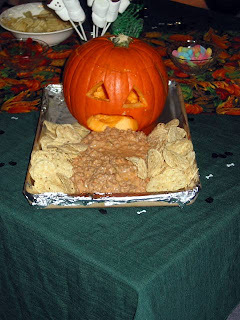 Do you have any fun or unique Halloween recipes? 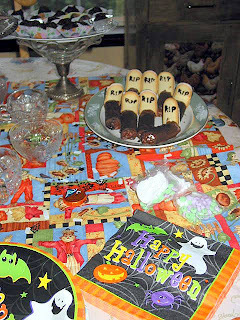 I'd love to see your pictures and recipes of Halloween treats! The most I have ever done was Graveyard Pudding, and that was for a party at school! That pumpkin is really not feeling well.